20 years ago John and I took the kids and their significant others on a Spirit of Chicago dinner cruise. At the time Julie and Ed were married, and the other two couples were dating. 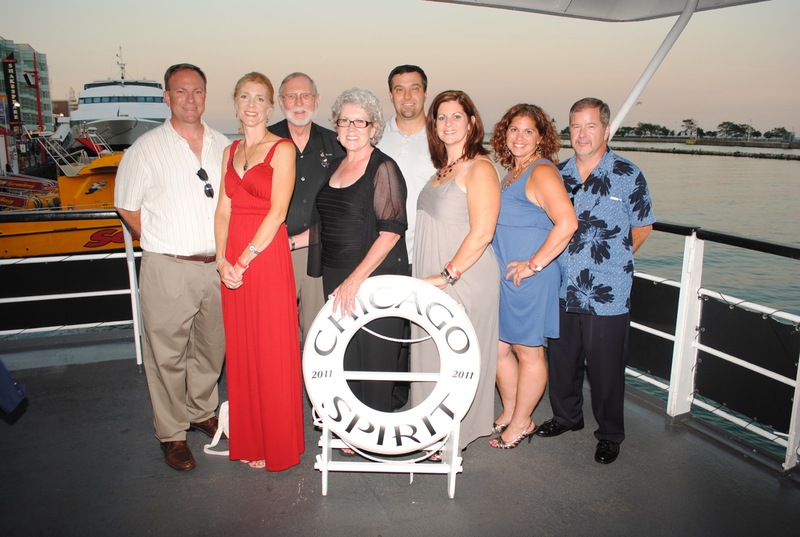 So now, 20 year later, we did the dinner cruise again, even taking our picture with each of us in the same position. Ah, the difference 20 years can make - in so many ways. The weather last night was fabulous. There's nothing like a view of the Chicago coastline at night. And the evening ended with fireworks from Navy Pier with our ship providing perfect viewing. The two sons-in-laws were designated drivers and provided door-to-door service for John and me. Party time's over - back to sewing! This 22" purple zipper has been burning a hole in my studio pocket. And while I'm amassing quite a nice little collection of purse and bag patterns, none requires a 22" zipper. So I bought this little pattern and am making the duffel bag. The directions? I don't how they are written and I'm not sure I understand them. They are designed for pre-quilted fabric, which I'm not using. In creating my own quilted fabric, I'm having to follow my instincts, create a lining, and construct this bag the way I see it. I think it's going to work. We'll know by Sunday! It happens every time. I don't care whether the quilter is 7 or 70. When someone finishes a project, there's a big goofy smile that just doesn't leave. Look at Debby and Jenny. They are thrilled with how their Hobo Bags turned out! And I am, too. They did great work in this 6-hour workshop, and it has paid off handsomely. Although both Deb and Jen have handled sewing machines before, they hadn't done any quilting and did a great job quilting the strap, body, and contrast band of their purses. They also constructed their linings and designed their pockets. Their zippers, with a bit of help from the Good Zipper Fairy, work beautifully, and their strap length was individualized for each. While Debby and Jenny were learning techniques of purse construction, I too was learning techniques of teaching purse construction. I now know more about teaching machine quilting and about zippers. This workshop went smoothly, and the next one will be even better! Wow, this went together quickly! Four strips became a set of 8. 8 strips became a set of 16. And finally 16 strips became a quilt that has 32 strips. This quilt top is 70" by 80". Because I was working with scraps from my stash, I had no idea what size top these strips would finish into. And the irony? This top is bigger than the backing fabric, which is what started this particular group of fabrics. Do I love this? No. But I don't hate it either. Once the back is pieced, this quilt will be a great charity quilt. It's cheery and definitely colorful. But I do love this technique. I am eager to try this again, using a much different set of fabrics. 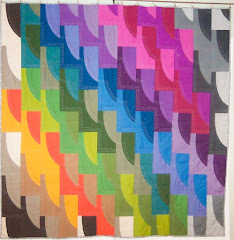 And this technique will be great at our next quilting retreat in creating some charity projects. The result was one extremely long piece. Then with right sides together, I began with the two ends of this long strip and sewed them together. My set is now 4 strips wide. I'm done for the day. I can't wait to get back to this tomorrow. One of the moms from last Wednesday chose a stony/brown batik with a brown contrast band for the purse workshop. But then when she got here, she changed her mind and decided to go with a great red/green batik. So yesterday and today I took these purse pieces and stitched them us, using a different lining and actually following the pattern's directions for the handle. I'm not sure about using this thinner batting, and I definitely do not like the way these handles attach - I much prefer stitching in the handle strap with the zipper construction. I might have to find one of my good friends, Mr. Seam Ripper, and remove these straps and reattach them. Chicago Modern Quilt Guild comrade Erika described her latest quilt as "Oh, NOW I get it" - and that's what I think with every project I do, including this purse. Having just reorganized my fabrics, I have become aware of some big pieces. One is shown here - a sheer striped cotton. I "stuck" CMQG buddy Rachel with several yards of it, and today decided to challenge myself to use this fabric with a technique Rachel talked about at our guild meeting. This fabric is going to be the backing, and I'm using its colors for the front. I've got 3" strips of several fabrics and will begin to make one long strip which will be assembled into horizontal rows. Good old Hagar the Horrible. Hat tip to John. The three hours this morning with the two moms just flew by. Even with the constant flow of conversation (these two are seldom without their children and have been friends since childhood) and a change in fabric selection, they finished exactly what I hoped they would. They quilted the bodies of their purses, quilted and made their purse straps, and made their pockets/linings. We need to pleat the body of the purse to the contrast band and insert the zippers. I think the Good Zipper Fairy - a close relative of the Good Quilting Fairy - might make a short visit this week just to ensure completion of the purses during next Wednesday morning's session. They had fun, and I did too! Purse Workshop - All Set! Wednesday morning two moms are coming over to begin making purses. They ave hchosen their fabrics, machines are threaded, and directions are being honed. My teaching method is to demonstrate every step. So I too will have a new completed purse. Say tuned for process pictures! And let our garden grow! For the past two days I've been working on a quilt designed by Ebony, making the quilt that will photographed for the pattern cover/directions. It's not my work so I can't show it. Instead, here's what John's been working on. In addition to blinging up our fence and populating the yard with a mob of meerkats and a birdbath, he's been planting - basil, dill, cilantro, mint, oregano, delphinium, knockout roses, phlox, and coral bells. I'm pretty excited about this - he's never done this before! So back to Sondheim and the final song from Candide: And let our garden grow! Actually it was two days without electricity. And of course I had Monday and Tuesday blocked off for some major sewing and organization. And - of course - I don't have a treadle sewing machine or a generator. After some major panicking about what I couldn't get done and using my brother's network while visiting my parents, I calmed down. Considering how electricity-dependent we are, John and I survived fairly well, thanks to our e-readers and a break in the hot weather. Grandson Brandon came over both yesterday and today and continued folding/organizing fabrics to earn money for his Boy Scout camping expedition next week. I don't think we're finished, but these shelves are a vast improvement. 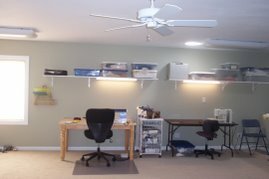 We still have a couple of shelves to finish, including the one with the really big pieces of fabric in the upper right corner. While Brandon was working on the fabrics, I finished piecing the quilt top for my cousin's daughter's wedding. It's going to be 72" x 96". And the backing is pieced from leftover from the front. The beginning of the week with the power outage was frustrating. It's good to be back on track and ready for the busy weekend. This quilt has 18 rows. Each row has 15 pieces. Each row has a grouting row in between. So that's - well, you do the math and figure out how many pieces. A lot. This quilt top is now in 6 pieces. More importantly, I've made some decisions about the borders. My Brick Wall is coming along. Most of the horizontal rows are complete. Now I just need to "grout" between these rows. My deadline to get the top pieced is next Thursday, and I think I'm good! The missing row is in my sewing machine. You can see the lines of my blue painters tape on the floor, marking a 60" x 80" outline. I'm making a wedding quilt for a couple I don't know at all, and the wedding is in August. I'm working on these two words: traditional and neutral. And I know that blue is good. So here's where I am so far. My white and neutrals have been cut into 4.5" x 8" bricks. There are two blues I'm using for mortar. This rough layout definitely suggests brick wall. Now I'm ready to work in earnest! My friend Nancy is on her way to Telluride where her grandson is getting married. After the wedding all guests will walk a path to a gondola which will take them to the top of the mountain, where the reception will be. And guests have been told to bring comfortable shoes for this walk. I asked Nancy if she had an appropriate bag to carry her shoes, and she didn't. So we matched this fabric to her outfit, and I made a Mors Bag. Nancy is a small woman and this bag is only for her shoes, although I did insert a little interior pocket in the lining, just big enough for Kleenex and lipstick. My husband met Nancy a few summers ago at a garden party. Later John referred to her as Nancy with the Pretty Feet. And so she remains. I'm ready to start a quilt top that must be pieced by the 15th. The palette is neutrals and a few blues. And the recipient is traditional. So I'm thinking. And thinking. I'm thinking a disappearing 4-patch might be fun and still give me the traditional look I'm going for. But I'm still thinking. Thursday was the deadline for my guild's informal mug rug exchange. Eileen and I swapped in person. What I love about Eileen's mug rug is the zig zag design, the neutral border, the bright binding, and the colorful backing. What I love about the one Elaine made for me is that it's her interpretation of Trip Around the World. I was so touched that she went to my blog to see what designs and colors I like! What a lovely gesture. And I love her "modern" spin on the design. This mug rug swap was great fun. A big thanks to Ebony Love for organizing it! 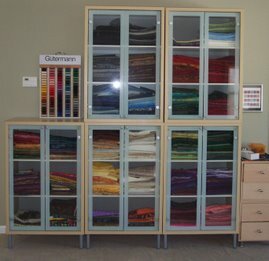 In addition to starting the neutral/blues quilt, I need to focus on my fabric shelves. Erika Sews recently linked to a fabric organizing tip, and I gave it a try. I LOVE THIS TECHNIQUE! I'm using a 12" ruler for larger pieces and a 6.5" ruler for pieces of fabric less than a yard. Look at the difference on the two shelves above. Grandson Brandon is coming over Tuesday morning to begin the rest of the shelves. 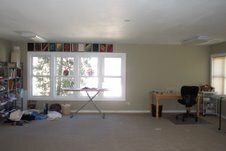 Look for more "before" and "afters."